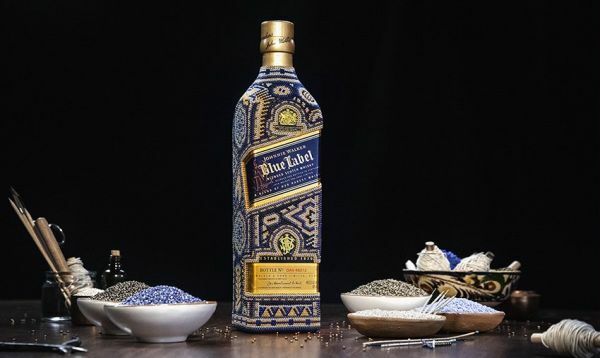 London-based spirits company Diageo has launched a special limited edition of Johnnie Walker Blue Label scotch whisky in bottles that pay tribute to Mexico's Wixáritari, or Huichol, people and their rich culture. Mexico City - Johnnie Walker Blue Label scotch whisky has launched a special edition to pay tribute to the Wixáritari, or Huichol, people and their culture during September, the month of Mexico's independence celebrations. The 50 bottles with distinct motifs were decorated by Mexican artists from Menchaca Studio, which specializes in arts and handicrafts, using chaquiras, or small plastic beads, traditionally used by the Wixárika to create intricate designs. "This edition shows the parallelism between Huichol design and the craft of whisky-making: unmatched talent and a remarkable history behind them. The best raw materials are required along with exemplary patience and passion, as well as excellence achieved through constant experimentation," said London-based spirits company Diageo, owner of the Johnnie Walker brand. The distiller explained that each of the 50 bottles has a unique design, with a special lot number etched on to it. Menchaca Studio founding director César Menchaca explained that the limited-edition bottles drew inspiration from the Wixárika's passion for art, life and culture, bringing to life mystical characteristics like peyote, a cactus with psychoactive alkaloids, particularly mescaline, deemed as a sacred fruit and bearer of wisdom; a blue deer representing the light of life; and snakes and scorpions, considered to be guardians of wisdom. The special edition scotch will be sold exclusively by Loma Linda restaurants in Mexico City for 11,000 Pesos ($570 USD) per bottle, a portion of which will be donated to the Wixáritari people. According to the market research firm Euromonitor International, Mexico's whisky market was worth US $2.8 billion in 2016, and is expected to reach $3.7 billion by 2021. Johnnie Walker dominates the domestic market with a 25% share, followed by Pernod Ricard's Passport with 13.1% and Diageo's Buchanan's with 9.8%.